Packed with strong language and even stronger content – don’t bring the kids! Satan in An Evening of Not So Quiet Despair With Satan. BOTTOM LINE: Satan attempts standup comedy, but as he reveals too many truths, God crashes the party. Have you ever wondered how Satan would do as a stand-up comic? Does he even have a sense of humor? Perhaps you need not wonder anymore in the radically offensive An Evening of Not So Quiet Despair With Satan. Satan’s therapist made the best/worst suggestion that he try standup comedy; even Satan admits the tactic is not working, but how can he deny himself an opportunity to have his own soap box? His set is so politically incorrect even God intervenes to put in his equally offensive two cents. The stage itself is simple. The wings are indicated by red cloth and there is a lone stage cube upstage. Therefore you cannot help but concentrate your focus on two characters who demand your full attention. Both actors command the space well and have clearly invested energy into adding dimension to their larger-than life characters. Perhaps the detail in this show that is executed best is how God and Satan command attention. 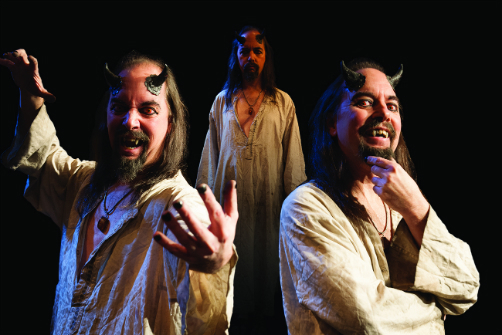 The actor playing God (the actors are not credited) does not have nearly the amount of stage time as Satan, but he does not feel the need to exert any energy to grab the spotlight. He can simply stand center stage and expect attention. The actor playing Satan, however, has to earn his attention. As the play’s opening reveals, Satan has had an eternity to realize he is a small speck of existence in which he plays babysitter for other, smaller specks of existence (the human species). After God has crashed his limelight, Satan ramps up his severity in order to prove he is still a force to be feared. At times I wondered at the transitions from topic to topic; director BZ Douglas and the uncredited writer try to fit a smorgasbord of topics into a short 40 minutes. Even so, I look forward to seeing how this show develops and grows.